Taken with a Nikon D70 and 70-300mm lens, ISO400 for 4 seconds at f/5.6 from the 28th floor of Lincoln Square in Bellevue. Seattle’s getting some bizarre weather this month. The other day, I was able to drag out the little telescope (Meade ETX90) and tonight the clouds cleared again. Today, I yanked out the big scope (Meade LX50). It’s 28°F outside again, and I spent the first hour and a half or so setting up the scope. I haven’t really had a good chance to use this telescope yet, so it took me a while to figure out what went where, and what parts I was missing and needed to search the house for. Nearly full moon tonight, so most of the viewing wasn’t that great, but I did get a good close-up look at the Pleiades (M45), a fair amount of the moon, and a brief stab at Mars. I need to get the spotting scope tuned in better before I do any significant viewing. According to Weather Underground, it’s currently 28°F outside. It snowed a fair amount last night, and now the snow that thawed most of the day is turning to ice. It’s been interesting watching people try to drive up the hill into our neighborhood. I heard tires spinning about 2 hours ago, so I decided to peek outside. Turns out that someone had abandoned their car a while back and was now trying to get it out of the middle of the road. Fun stuff. I then noticed that the moon was out, and Orion was out. The ever-present winter clouds had pulled back. This means two things: it’s gonna be cold tonight, and I had a great opportunity to take some pictures. 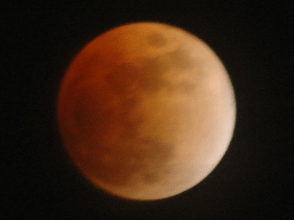 I grabbed the camera, threw on the 70-300mm lens, and unpacked the tripod. It was in one of the few boxes that we decided not to unpack. Out I went, shooting pictures of the moon and Orion with varying degrees of success. The moon is easy enough to capture. It’s actually really bright – since the sun is reflecting off the moon, it’s actually nearly as bright as the surface of the earth would be. 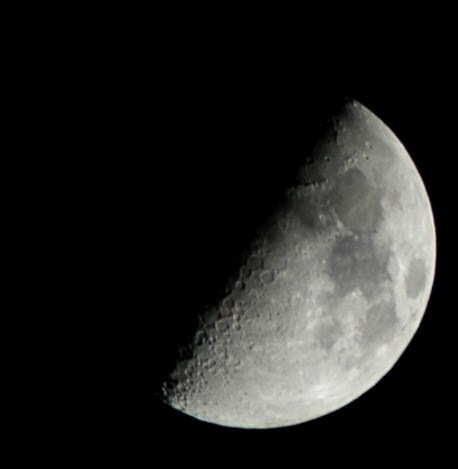 The rough rule of thumb for moon photography is an aperture of f/8 at 1/125th second exposure. I took the picture at right at f/8 and 1/100th second at ISO200. A 300mm camera just captures enough detail to start identifying craters, but a tripod is an absolute necessity. Enough with moons: how about stars? 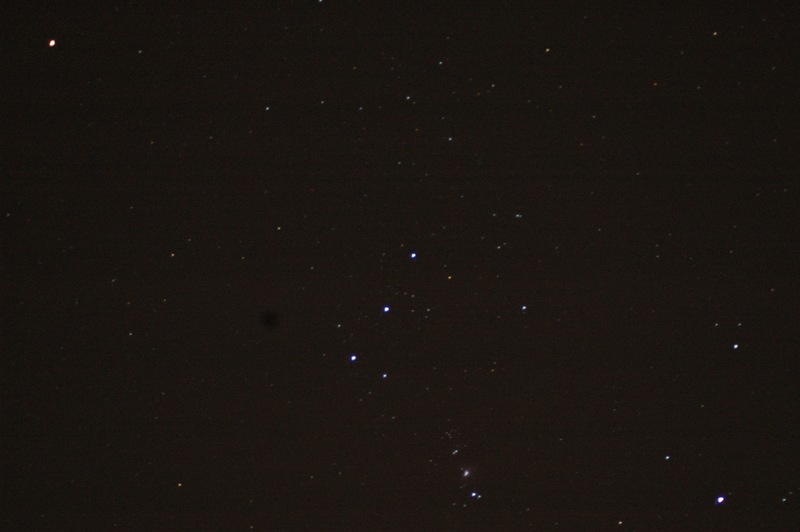 Orion was out, so I pointed my lens that way. My 70-300mm lens worked again here, just barely fitting Orion into the view at 70mm. My best picture came out at ISO800 at f/4 with a 13 second exposure. Unfortunately, there seems to be a big dust bunny on my Nikon’s sensor that I need to clean, but otherwise I’m very pleased with the photo. Even at the scaled down version here, Orion’s belt, Betelgeuse, and Rigel are easy to make out. Looking at the full-size picture (click the photo to see it), you can actually make out the Orion Nebula (M42) and some binary star systems at the bottom of the photo. I decided at this point to drag out the small telescope, a Meade ETX-90. Using eyepieces between 26mm and 9mm, I watched the moon move around the sky for about a half-hour before I turned towards Orion. Since I was laying on the ground looking through the scope (no tripod for this one, sadly), it took me quite a while to find anything related to Orion – but eventually, I found what I was looking for: M42. With the ETX-90, I couldn’t make out the vivid colors of the nebula, but I could make out 5 stars of the trapezium cluster with some of the tell-tale nebula clouds around them. Unfortunately, about that time our local clouds decided to crowd back in, and that killed my viewing for the night. Next time it’s this clear at night, I’m going straight for the big telescope.